Historical monuments are invariably exposed to the influence of the geological environment. Given the lifespan of such structures, several dynamic geological processes (weathering/erosion, surface movements and earthquakes) usually have a dramatic impact on the integrity of the monuments. The protection of monuments requires special approaches in terms of adaptation of the engineering interventions to the historical environment and the lifetime of such interventions. The significant cost and implicit long-term effectiveness of engineering schemes for the protection of historical monuments necessitates integrated approaches requiring on-going validation of the design. The co-operation between the designer and the contractor during construction and long-term performance monitoring are key components for the success of such undertakings. Structural damage to the architectural heritage is often caused by the displacement of the earth’s soil, its differential settlement, its rotation, or any other effect of the interaction between the structure and the soil. Although it is necessary to examine both the shear resistance and the underlying settlements of any structure, the research is very limited and focuses on mechanisms of failure of superstructures only [1–7]. 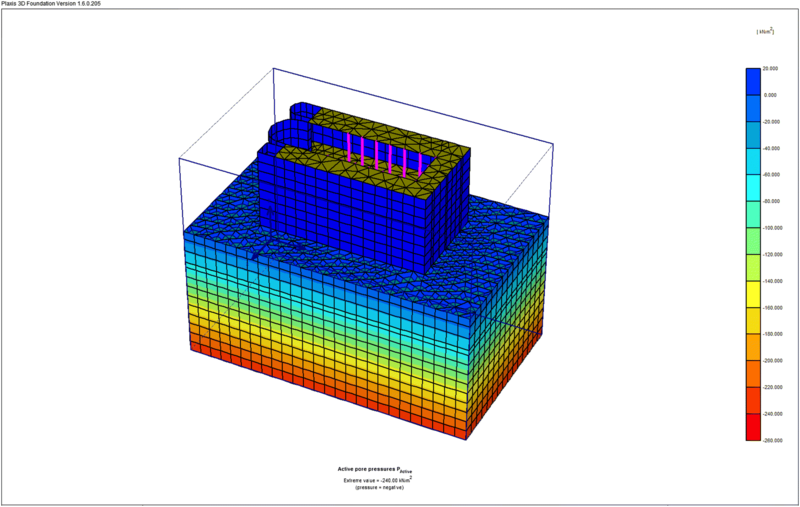 To determine the magnitude of stresses, analyze the deformation and settlement of the soft silty clay soil and the superstructure response, an analytical coupled model of geotechnical and structural engineering is presented in detail. Geotechnical numerical modeling of complex soil structure problems requires advanced three-dimensional advanced soil models. PLAXIS 3D (PLAXIS v.b 2018) was used to calculate the soil settlement due to consolidation and the impact of its accompanied pressures and stresses on the superstructure. It is a program produced for the geotechnical construction plan and inquired about it and was used late as part of the structural and geotechnical survey. The Mohr–Coulomb model is used for both static assembly and rigidity inspection. The code contains a useful methodology for the programmed batching drive, called Load Advancement, which we used here [8–10]. Constitutive models are the key-stone not only for understanding the mechanical behavior of soils but also for carrying out numerical predictions by means of the FE method [11, 12]. Since 1970s, there are extensive studies on elastic–plastic model about saturation soil under dynamic loading. Building model under monotonic loading and using relatively complicated hardening law, such as the model based on modifier Cambridge model by Carter , the Desai model with single yield surface built in 1984 . The dynamic model based on other types of plasticity theory, such as multi-surface model built by Mroz et al. and Provest [15, 16], secondary loading surface model built by Hashiguchi in 1993, the plasticity model of sand based on multi-mechanism conception under cyclic loading by Kabilamany, Pastor et al. [17, 18]. 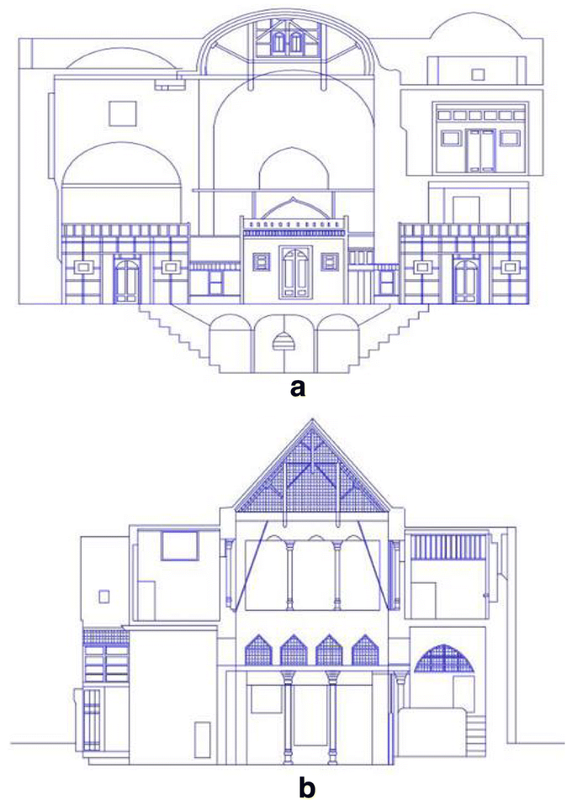 The evaluation methodology which has been followed for the structural rehabilitation of Abu Serga church (which is located in old Cairo area in Cairo) comprised the following phases/actions, as summarized in Table 1. 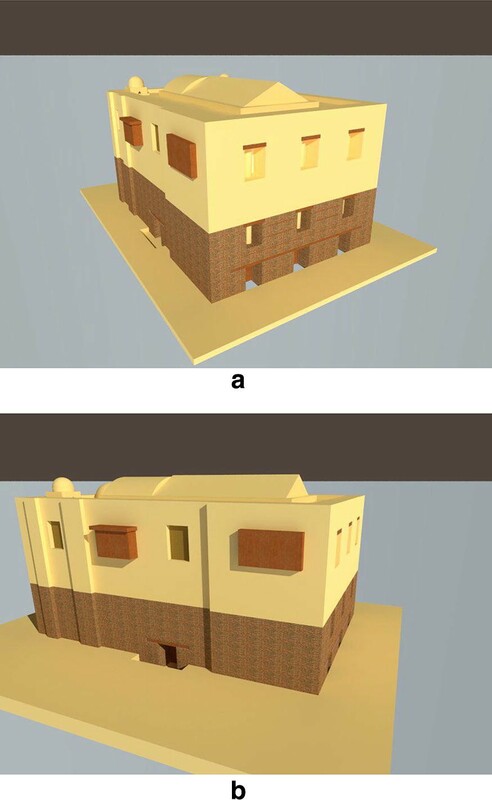 Methodology established for the study of historic masonry structures were assessed in terms of their reliability, accuracy and effectiveness by comparing analytical results with experimental and empirical data [19, 20]. The subsurface conditions of the Abu Serga church consists of multi layers of thick soft clay mixed with variable sand. The fine sandy layers are shown to the middle at a depth of 6 m below the floor level of the chapel. The subsurface water appears at a depth of 1.8 m . Figure 1 shows the ERT-3 reflection model on the main street of Mar Girgis, at a height of 5 m above the level of the ground floor of the church. The geotechnical investigations carried out on the extracted soil samples. Data was collected from five (5) (boreholes), four (4) (PCPT/CPT), and eighteen (18) Undisturbed Samples (US). The results of laboratory tests were selected over eleven (11) grain size distributions, five (5) oedometer tests, three (3) direct shear tests, six (6) triaxial CU+ u tests and five (5) triaxial UU tests. The geotechnical testing has been carried out in the Soil Mechanics Laboratory of Faculty of Engineering, Cairo University. The physical and geomechanical characteristics of bearing soil layers under church are presented and summarized in details in Table 2. CPT and CPTu data reveal that the soft clay soil layer is characterized by a tip resistance (qc) lower than 1 MPa and the friction ratio is between 1 and 3. For Sand Layers: Atterberg limits, liquid limit (WL) = 20, plastic limit (Wp) = 0, dry unit weight γdry = 18 kN/m3, saturated unit weight γsat = 21 kN/m3. For the elastic parameters, Modulus of Elasticity E = 6000 KN/m2 and Poisson’s ratio υ = 0.35. For the shear strength parameters of this sand, the cohesion of grain particles c = 0 kN/m2 and internal friction angle ϕ = 34. By the dewatering project in 2000, differential soil consolidation settlements were recorded between different parts of the subsoil and structures of Abu Serga church and other surrounding churches and chapels in the area. Settlements have been calculated up to 0.9 cm at the areas of filter wall in the old Cairo archaeological area. Another important parameter, necessary for the complete documentation of the structure and for understanding its behavior and response due to the subsoil settlement, is the identification of construction and building material engineering properties, which may have different characteristics depending on construction phases of the historic masonry structure. Thirty brick samples and specimens have been collected from different locations in the structure of Abu Serga church, and the physical and mechanical testing have been achieved in the Laboratory of Building Materials in Faculty of Engineering in Cairo University by the author. The averaged results indicated that; (1) Physical properties, for specific gravity (Gs) it is ranged between 1.8 and 2.0 g/cm3, water absorption (Wa) is 20.1%, Porosity (n) is 27%. (2) Mechanical properties, uniaxial compressive strength (σc) is 1.6–4.7 MPa, Brazilian splitting tensile strength (σt) is 1.8 MPa, primary wave velocity (Vp) is 1.71 km/s, static Young’s modulus (E) is 8.4 GPa, dynamic Young’s modulus (Edy) is 2.4 GPa, and Shear modulus (G) is 917 MPa. 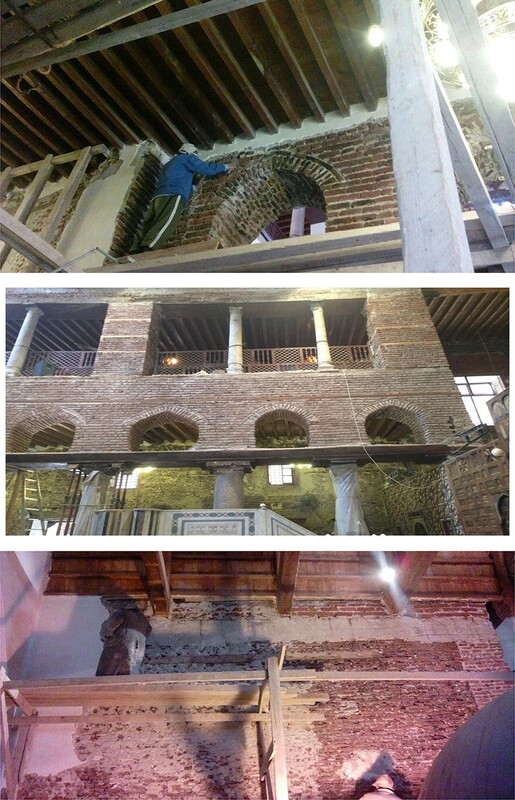 The results from the physical and mechanical testing referred that the main construction materials of the church which is the bricks are in advanced state of deterioration and demand a necessary strengthening and retrofitting interventions. 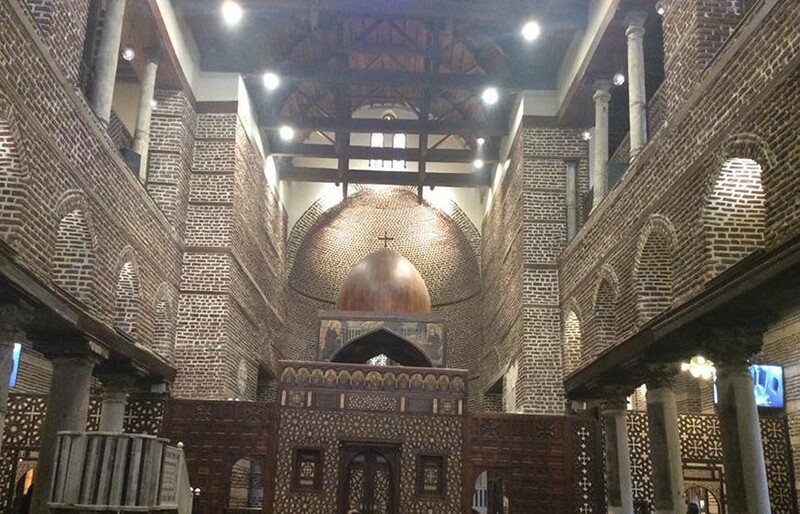 Red bricks and the hydraulic mortars were of the most important construction materials used in the Coptic churches including the subject of the present study “Abu Serga church” in the old Cairo. Generally the studied fired brick is formed mainly of quartz and feldspar grains. These grains are embedded in a ferruginous dark brownish groundmass formed mainly of iron oxides (hematite) and burnt clays. The bricks have various colors and dimensions and formed mainly from local raw material (Nile sediments) together with some additives (rice hush and/or plant ash to improve their properties. They are of medium density, high porosity due to the weathering activities (subsurface water and salt weathering. They have wide range values of their physical and engineering characteristics (e.g. specific density, water absorption, porosity, ultrasonic velocity uniaxial compressive strength σc, static modulus of elasticity, dynamic modulus of elasticity, and shear stress). 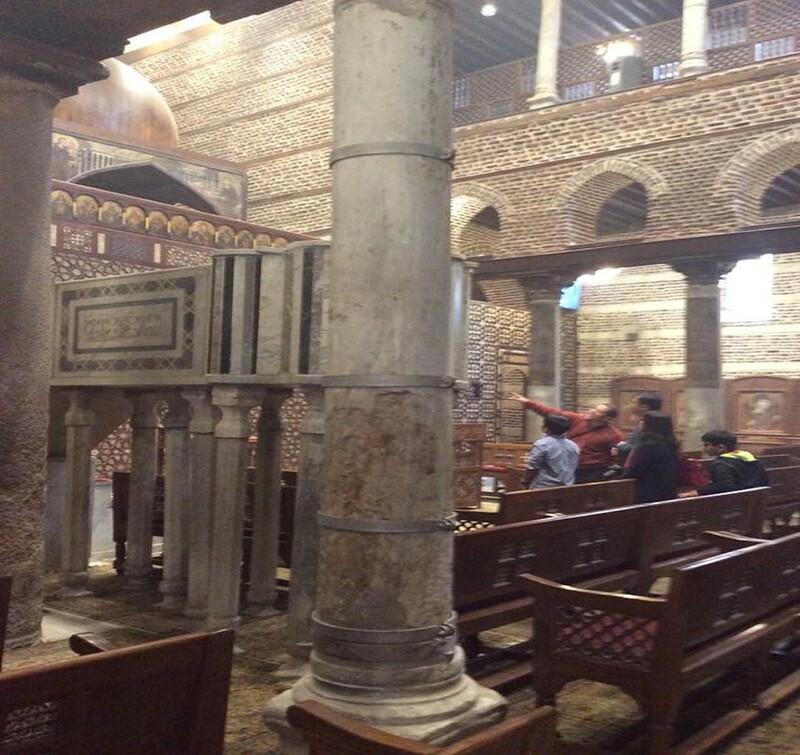 Ten marble samples and specimens have been collected from the fallen fragments and from different deteriorated locations in the marble columns inside Abu Serga church. The averaged results indicated that; (1) Physical properties, for specific gravity (Gs) it is ranged between 2.6 to 2.8 g/cm3, Water absorption (Wa) is 12%, Porosity (n) is 32%. (2) Mechanical properties, uniaxial compressive strength (σc) is 16 MPa, Brazilian splitting tensile strength (σt) is 6 MPa, primary wave velocity (Vp) is 2.87 km/s, static Young’s modulus (E) is 30 GPa, dynamic Young’s modulus (Edy) is 11 GPa, and Shear modulus (G) is 1195 MPa. The results indicated a very poor mechanical characterization of these marble columns which could affect the stability of these structural columns and induced the deformation patterns which is obvious. 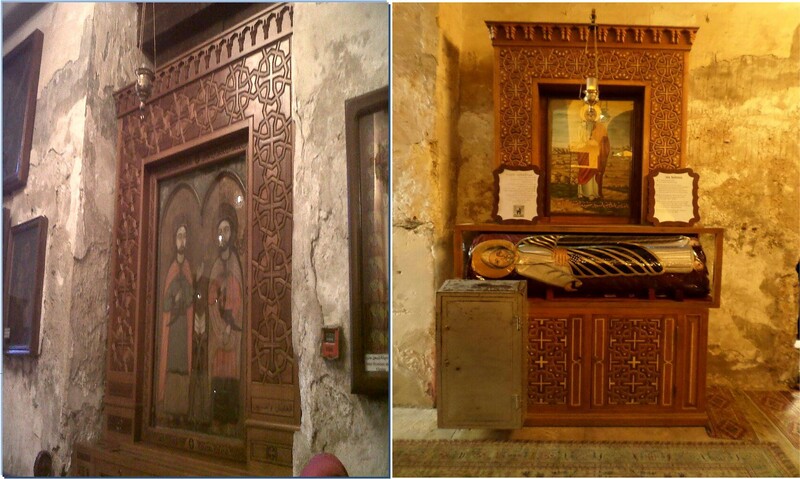 Four wooden samples and specimens have been collected from different locations in the roof of Abu Serga church. The field observation and the averaged results of the mechanical testing indicated that the structural wooden beams which support the roof are deflected in high value due to the overloading and the material decay and degradation; (1) physical properties, for specific gravity (Gs) it is ranged between 0.64 to 0.69 g/cm3, Water absorption (Wa) is 30%. (2) Mechanical properties, uniaxial compressive strength (σc) is 8 MPa, Brazilian splitting tensile strength (σt) is 3 MPa, Static Young’s modulus (E) is 7 GPa. Abu Serga church is a small chapel with a length of 29.4 m and a width of 17 m and a height of 15 m. The ground floor is about 1.5 m under the surrounding alleys and 4.5 m down St. George’s Main Street. It features a typical basilica design with a gallery leading to a nave with two side aisles, and these passages are separated by twelve equal marble columns of row. Three sanctuaries occupying the eastern side of the church. In the northern and southern ones, there are internal underground stairs leading to the Holly crypt. The height of the Holly crypt is about 6.5 × 5 × 2.5 m with two columns rows containing a longitudinal series of arches on each row. These two rows of columns are divided into three long shallow domes, which can be considered a plateau with northern and southern passages. Modern architectural surveys and studies presented in this study indicated that the length of the church is 29.40 m and its total width, including the external open court accompanying 24.50 m, as shown in Figs. 2, 3, 4, and 5. Abu Serga church suffered great deterioration due to the extensive cracking due to the settlement of the subsoil and the surface movements. The internal deformities of the two facades of the church are clear, as shown in Fig. 6. Settlement and the rotation and inclination of the structural marble columns and the different cracks in the arches inside the church are well observed; also the vertical cracks in the lintels inside church are shown in Fig. 7. Seismic loading, according to historical facts the powerful earthquakes and the recent earthquakes in particularly the Dahshur earthquake 1992 and Aqaba earthquake 1995, that have stuck old Cairo area, caused small or medium damages to Abu Serga church. The excavations of the underground metro; many damage and deformation patterns well observed through the structure of the church due to excavation induced subsidence. In this study; PLAXIS 3D performed with a plastic material model to determine the behavior and nonlinear response of the saturated soft silty clay soil and masonry structure of the church. 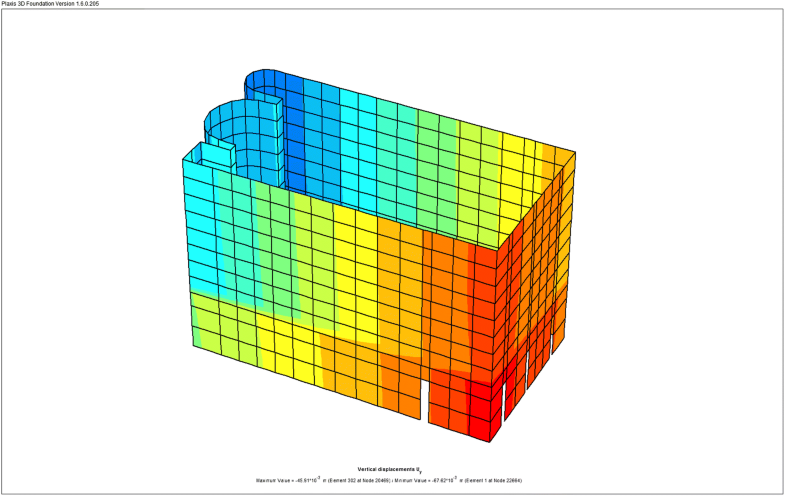 Plaxis is a commercially available program which is using finite element method FEM. Plaxis is using different soil models to define soil behavior such as Mohr–Coulomb Model, Hardening Soil Model, Soft Soil Model, Soft Soil Creep Model, Jointed Rock Model and Modified Cam-Clay Model. 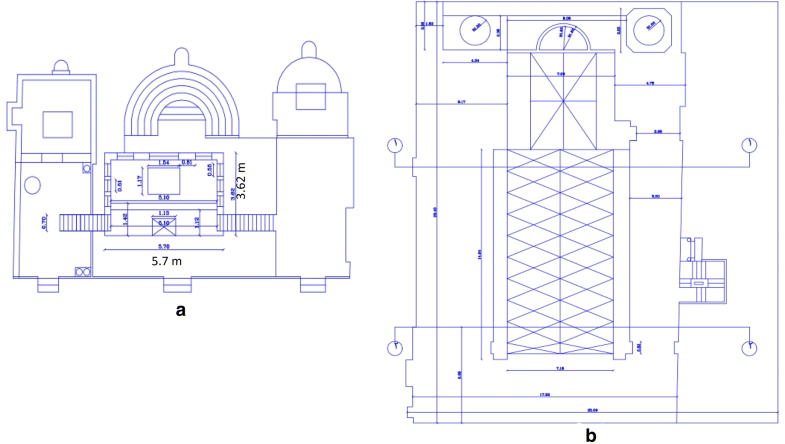 Mohr–Coulomb Model is chosen for this study because it is commonly used and not required extra soil parameters. The Linear-Elastic Perfectly-Plastic Mohr–Coulomb demonstrate includes five information parameters, i.e. Young’s modulus E and Poisson’s ratio nu (ν) for soil flexibility; Cohesion c, friction angle phi (φ) and dilatancy psi (ψ) have to do with soil shear behaviour. The Mohr–Coulomb model represents a ‘first-order’ approximation of soil or rock behaviour. Mohr–Coulomb model is a straightforward and pertinent to three-dimensional stress space model to depict the plastic conduct of earth soil and its immersed conduct and related stream. As to quality conduct, this model performs better. 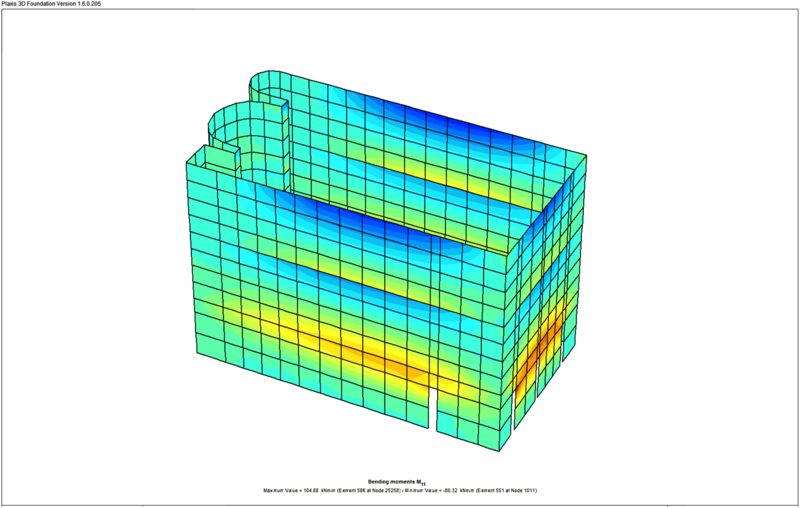 This model is applicable to analyses the stability of shallow foundations and the soil problems. For Mohr–Coulomb flow rule is defined through the dilatancy angle of the soil. In soft soils volumetric plastic strains on shearing are compressive (negative dilation) whilst Mohr–Coulomb model will predict continuous dilation. 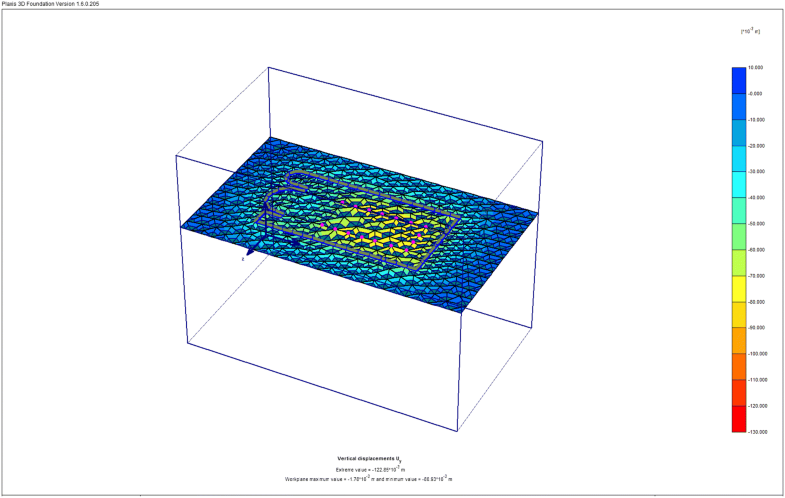 Numerical modeling of the plane strain using the PLAXIS 3D (version 2018) was adopted. Consists of 15 nodes of finite trigonometric elements with a medium precision network to reduce the calculation time. All the geotechnical characteristics of the soil layers and engineering characterization of the building materials of Abu Serga church are listed in Tables 2 and 3. The Mohr–Coulomb constitutive law was chosen to describe the behavior of saturated soft clay behavior. The water is located at 1.8 m deep. The settlement was monitored according to the time given for the actual settlement . Subsoil behavior is studied in details. The masonry structure of the church was modeled using solid element module, the solid element properties taken as defined above in design criteria [23, 24]. The church was modeled using frame elements for marble columns and shell elements for the ceilings with same properties in the mentioned reports above. Rigid links are used to connect all brick walls together to act as one unit, rigid links defined with very high moment of inertial and weightless. Elements cross sections solid elements thickness varies from 160 to 70 cm along the height. Beams cross sections 25 cm * 80 cm. Slab thickness is 16 cm. Successful use of a mathematical analytical model can provide information on the type, extent and location of damage and unsafe zones and safety levels. The results of the numerical analysis of church are shown as originally designed that some of the surface subsidence occurred during its construction on thick layers of soft clay (6 m) and because of the drainage or dewatering project in 2000. Displacement developed on the surface, above the maximum value of about 122.85 mm, is the total consolidation settlement and failure of local shearing of the soil due to the in-plane loading. Figure 8 shows the geometry and FE discretization of the 3D model and the deformed mesh and the calculated vertical displacement Uy of the saturated silty clay soil with the structure loading and appears distributed under the superstructure of the church in Figs. 9 and 10, the extreme value Uy is 122.85 mm. 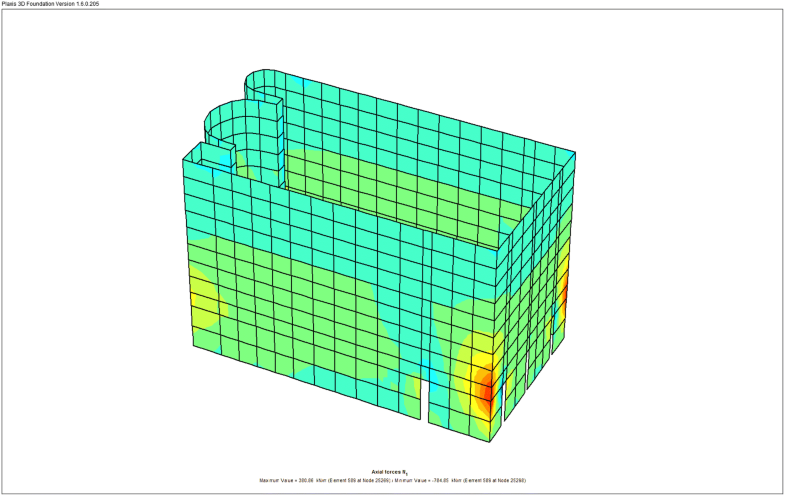 The volumetric strain εv distribution of the subsoil is shown in, with a maximum value of 4.50%. The initial effective compressive stresses was determined at the middle of the clay layer depth, where σv = 60 kN/m2. The effective mean stresses P on the subsoil is shown below the structure with a maximum value of 192.85 kN/m2, as shown in Fig. 11. The average effective stress is also calculated and the maximum value is 192.85 kN/m2. The active pore pressure Pactive distribution in the ground, where the maximum value of Pactive is 240 kN/m2 as shown in Fig. 12. ΔΗ is the consolidation adjustment, Cc is the compression index, H is the height of the clay soil layer, e0 is the initial vacuum ratio, P0 is the initial effective vertical stress in the middle of the mud layer depth, ΔP is the change in the vertical effective stress . where the thickness of layer H is 5.5 m, the compression index Cc = 0.3, the initial stress in the depth of the clay layer is P0 = 60 kN/m2. The initial void ratio is 1.84. The subsidence and settlement of the subsoil may affect seriously the superstructure of the church. The main reasons were the consolidation of subsoil clay layers. Also the shear failure characteristics of subsoil may lead to the ground subsidence. 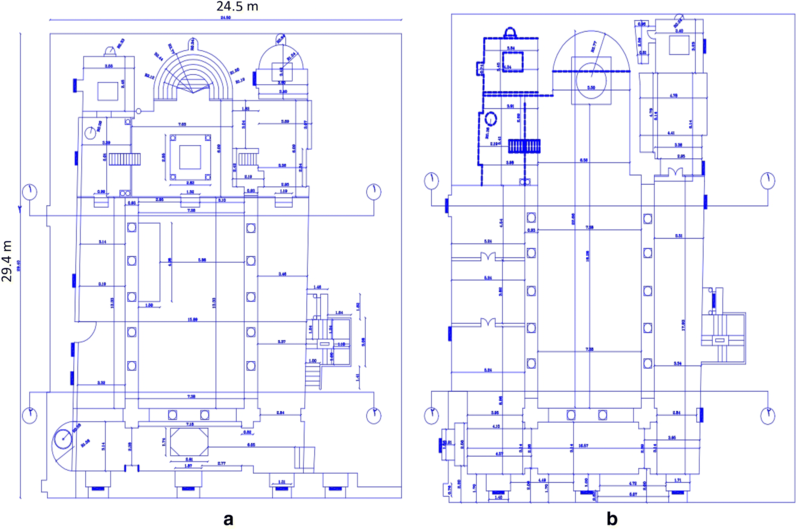 The results of the numerical analysis indicated that the distribution of the Uy vertical displacement of the church superstructure, with a maximum value of 67.62 mm, and minimum Uy value is 67.62 mm as shown in Fig. 13. 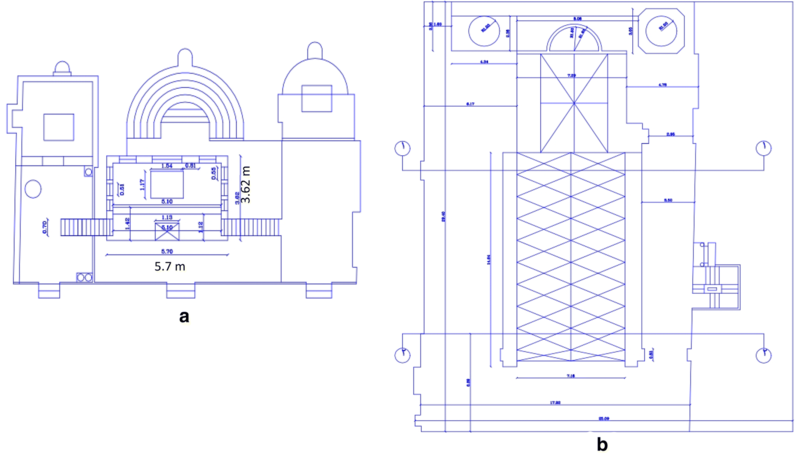 While the maximum value of horizontal displacement is 8.91 mm, represent the distribution of the horizontal displacement Ux of the structure of the Abo Serga church, the maximum value of Ux is 8.91 mm and the minimum value of Ux is 2.83 mm. Figure 14 illustrates the normal axial force N1 on the superstructure of the church; the maximum/minimum principal stresses, the maximum value is 784.85 kN/m and the minimum value is 380.88 kN/m. The shear force Q1 on the superstructure of the church, is with a maximum value of 305.38 kN/m, and the minimum value is 208.96 kN/m as shown in Fig. 15 which represent the maximum/minimum principal stresses. Figure 16 shows the maximum/minimum principal stresses, the bending moments of M1 on the superstructure of the church, with a maximum value of 104.88 kN/m and the minimum value is 80.32 kN/m. 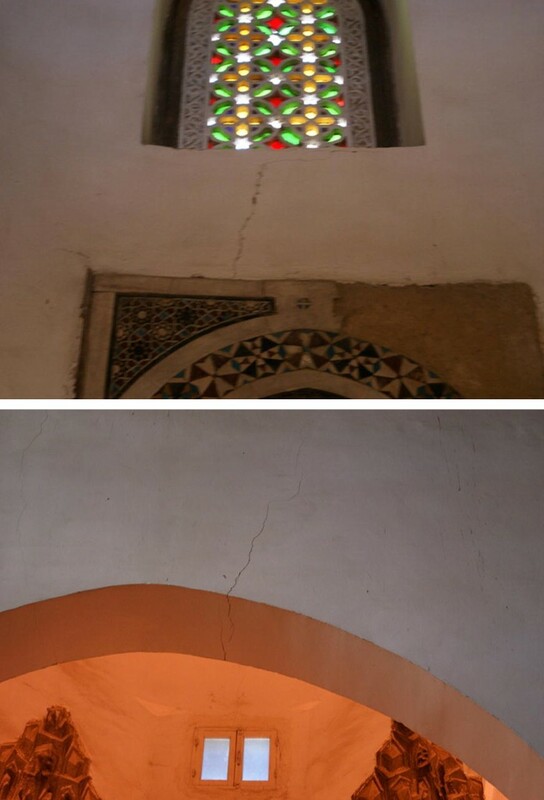 bending moment 105 kN per length unit is relatively high value, it may be the main cause of the out-plane deformation and the cracks patterns on the main facades of Abu Serga church, and it observed and recorded from the field and experimental studies. 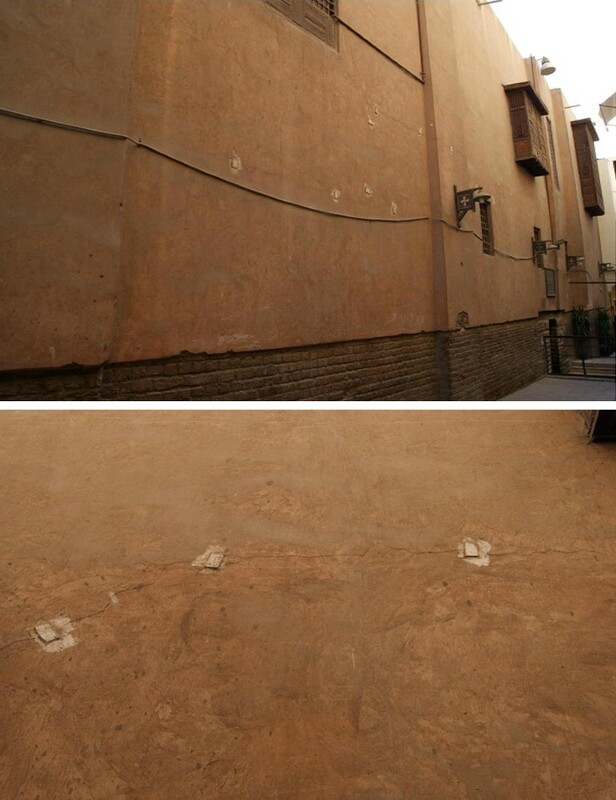 The computed static surface ground displacements under Abu Serga church are in high values: maximum total vertical displacements is 122.85 mm, which is not acceptable or permissable. Many researches like [27–32] discussed the permissable maximum settlement for the shallow foundations in clay soils; and indicated that, for the loading bearing walls, the permissible maximum settlement is 60 mm in case of isolated footings, and 125 mm in case of raft foundations. The maximum normal axial force N1 on the structure is 784.85 kN/m is very close to the uniaial compressive strength of the original brick (1400 kN/m2). Moreover shear force Q1 is on the superstructure of the church, with a maximum value of 305.38 kN/m, which is also close to the measured shear strength of the rock material (600 kN/m2). The results also indicated that the overstress state is beyond the elastic regime. With a global factor of safety (FoS = strength of component/load on component) equal to 1.78 (< 2) the Abu Serga church should not be considered as safe under static conditions, an FoS of 2 means that a component will fail at twice the design load. In conclusion the detailed analysis of the Abu Serga church proved that these important monuments present low safety factors for both static loading and soil consolidation settlement. Consequently a well-focused strengthening and retrofitting program is deemed necessary. It is deemed necessary to upgrade the safety reserves due to the special nature of the structure. 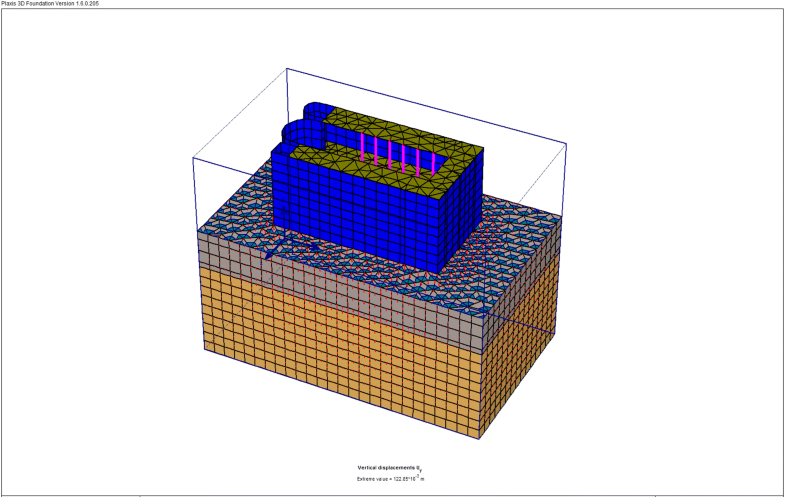 From the results of the numerical modeling, indicated that the structural deficiencies in the superstructure of the oldest Cairo church, mainly the diagonal, shear and vertical cracks and other distortions within the plane, are mainly induced by the differential settlement of the full saturated clay subsoil consolidation. The technical assessment revealed that almost all level masonry structural walls presented a brittle mode of failure and more than that, from the first level were of “weak and soft stories” type. The Intervention and strengthening measures and work for the church included the improvement of the subsoil layers, reinforcement of the shallow foundations and the strengthening of the superstructure the church. Table 4 summarized the main aspects of structural strengthening of architectural heritage. (a) Masonry walls Pozzolanic grouting or stitching in cracks. Improvement of the of soft clay soil with jet injection techniques and liquid normal Portland cement. When the structural elements are capable of taking care of the total weight of the historical construction structure. Improvement of shallow foundations found by low pressure injection of hydraulic lime mortar was necessary. It was important to design the stitching system to connect the brick walls to the superstructure elements together. Extensive grouting was undertaken for filling of the wide cracks across the highly disturbed walls zones penetrating 200–300 mm into the walls. Grouting was carried out prior to the prestressing of the anchors to work load levels. Our previous experimental study referred that the mix of hydraulic lime + sand + brick dust + small proportion of white cement 3:1:1:0.2 respectively gave the best results under the mechanical testing. The hydraulic lime based grouts (due to their improved bond properties with the in situ materials) become more important due to the durability ensured by the use of materials that are compatible with the existing ones from the physical–chemical point of view . Restoration and improvement the connections between brick walls. To prevent wall cracks in the longitudinal direction, reinforce the walls with high-strength strips and insert at least 50 mm in the wall joints in some layers. The number of common layers entered in the ranges was calculated according to the additional tension obtained through the analysis, as shown in Fig. 17. It recommended the inclusion of lead strips with a thickness of about a few millimeters in joints per 1.5–1.5 m above ground to ceiling in double walls. For the stone sections, it should not be isolated. This causes fins to be caused by small, low-magnitude earthquakes, but they are stopped for centuries and prevented from ascending and damaging the structure. After the structural reconstruction of the brick walls, it was necessary to reset all surfaces using lime mortar and remove previous interventions using cement paste. Straightening up and reinforcing marble and granite columns with steel ring beams. Restoration of frescoes and icons. Figures 18 and 19 illustrate the state of preservation of the church before the strengthening and retrofitting intervention project. 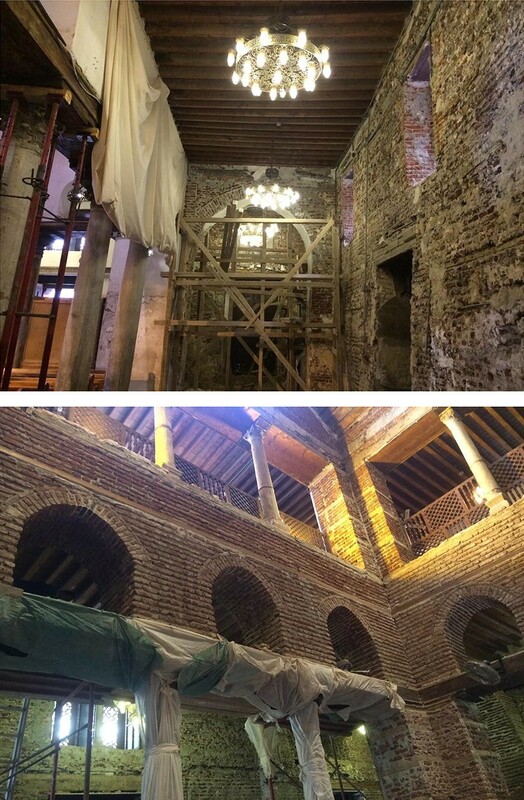 Figures 20 and 21 illustrate the strengthening and intervention retrofitting processes and measures which had been done during the restoration project for Abu Serga church. The present preservation state of the church is provided after the complete installation of remedial measures for therapeutic intervention as shown in Figs. 22 and 23, especially in the cleaning of walls, removal of salt and stitching, and supporting the reinforcement of marble columns with designed steel rings. The assessment of the stability of the ground (bearing soil) and the induced structural deficiency were examined in the Abu Serga church. A three-dimensional FEM model was used to conduct several types of plastic and unit analysis. The long-term structural deformation of the structure has been analyzed over the past centuries to find an appropriate way to improve and modify it. The numerical model has been calibrated based on the on-site measurement data to determine the corresponding model parameters. Different ways of improving the parameter have been investigated. It is therefore possible to conclude that modeling soft mud behavior under the Abu Serga script by numerical analysis is appropriate for understanding the geotechnical behavior of the problematic soil type and structural behavior of the structure above it. Various types of soil reinforcement and structural strengthening techniques have been tested to better fit this structure. 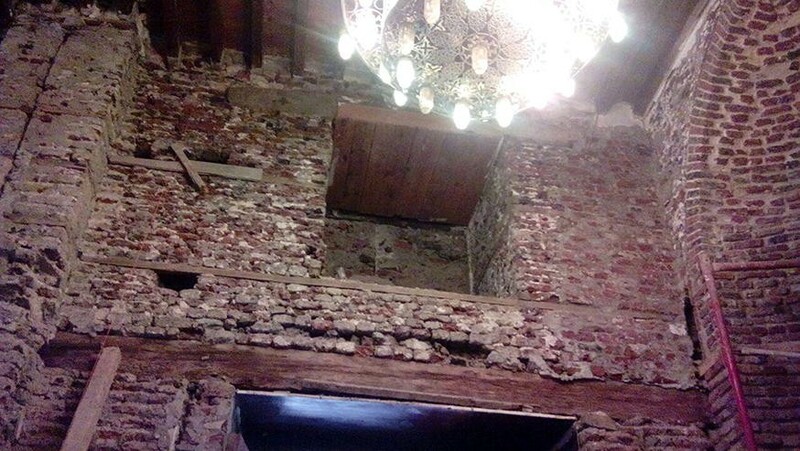 The results of the analysis indicated that the deteriorated cement plaster layers that covered the interior brick walls during the 1960s should be removed due to its high damage and decay due to the high rise of subsurface water and humidity, as well as the damage to the brick walls due to the consolidation settlement of the bearing soil as well as the geotechnical and structural effect of the earthquakes in particular the Dahshur 1992 and Aqaba 1995 earthquakes. In conclusion, the detailed analysis of the church of Abu Serga proved that these important Coptic architectural heritages represent low safety factors for both static loading and soil settlement. Accordingly, the existence of a well-focused strengthening and retrofitting intervention program was very necessary and essential. The author confirms that he is not currently in receipt of any research funding relating to the research presented in this manuscript.